Potatoes are heaped high in the storage building at the UW–Madison Hancock Agricultural Research Station, situated in the middle of the Central Sands area of Wisconsin, one of the most productive potato-growing regions in the country. Hancock has stored these potato samples to see how well they will last in storage, and equipment operator Sam Perez keeps a close eye on the stored spuds. 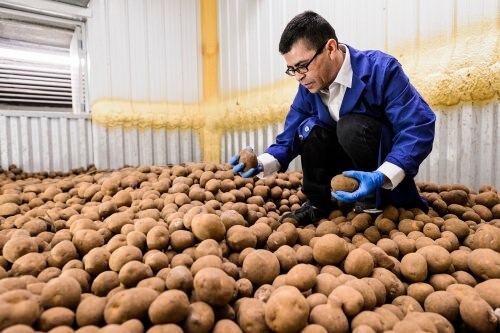 By monitoring sugar levels, frying test batches of potato chips, and other techniques, Perez and other station employees help growers decide when to market their stored potatoes. Waiting longer usually means a higher price, but only if the potatoes are sound and un-sprouted. 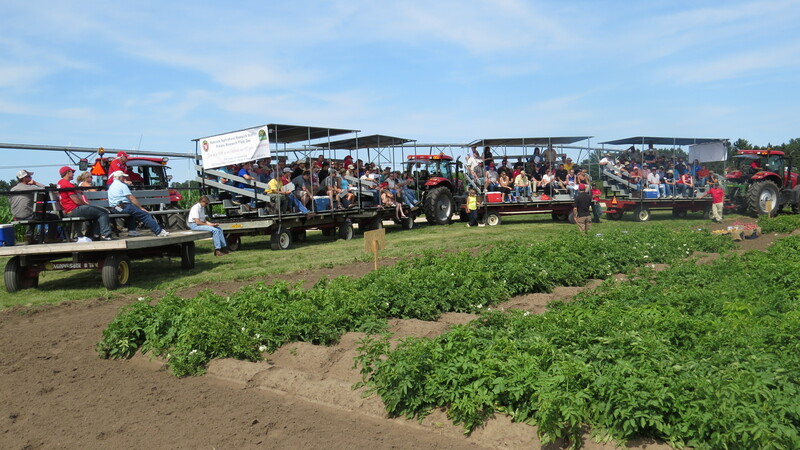 Storage is a big concern for Paul Bethke and other UW–Madison horticulturists who breed and grow potatoes at the station. Wisconsin is ranked in the top five nationally in production of potatoes, sweet corn, green beans, peas, carrots and many other processed vegetables. 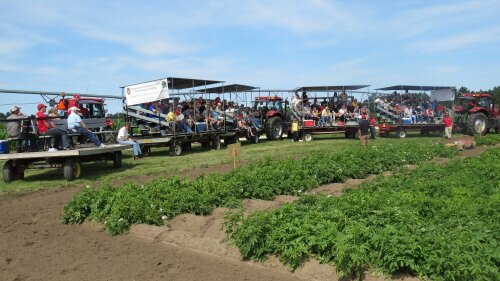 The Hancock station, located along Interstate 39 between Stevens Point and Portage, plays a central role in Wisconsin-oriented potato research. In 2006, the Wisconsin Potato & Vegetable Growers Association raised $3.2 million for the storage building where Perez spends half his year. When fieldwork begins, Perez moves outside as one of the site’s field technicians where he also performs preventive maintenance and repair on the station’s farm equipment and vehicles. During four years at Hancock Agricultural Research Station, Sam Perez has earned a reputation as methodical and willing to handle any task. Those qualities made him one of eight University of Wisconsin–Madison employees to receive the 2017 University Staff Recognition Award. Lady luck played a significant role in delivering him to a job that he loves. Sam and Andrea Perez, both Chicago natives, first moved to Wautoma in 2000 and found the Central Sands a welcome relief from the big city bustle. In 2012, after two unsatisfactory years in Florida, they opted to return to Wisconsin. Unable to decide where to set up house, they taped a state map to the wall and threw a dart. It struck within spitting distance of the Hancock station. Perez, who had previously worked on potato farms and knew the area, applied for a job. In the years since, he’s proven to be a jack of all trades, master of many, and reliable and hardworking enough for Troy Fishler, Hancock’s storage facility manager, to nominate him for the staff award.